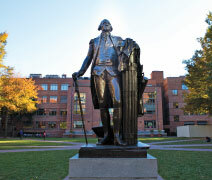 Founded in 1821 by an Act of Congress, The George Washington University (GW) offers more than 70 majors and over 2,000 courses across seven undergraduate schools. We go beyond the typical university experience with an education that is deeply connected to our location in the center of Washington, DC. Our nearly 10,000 undergraduates actively engage the city and the world through hands-on learning experiences, where they study alongside faculty experts, policy leaders, and extraordinary individuals in every discipline to shape global progress and define the issues that will shape the present and future. GW maintains two fully integrated campuses in Washington, DC, with residence halls and classrooms located on both and free shuttle service provided. Through these two different learning environments, students have the ability to create a college experience that is uniquely their own. Our Foggy Bottom campus is blocks from the major landmarks that make Washington one of the most recognizable cities in the world. Our students can study on the steps of the Lincoln Memorial, jog to the Washington Monument, or take a stroll to the White House and Kennedy Center. Our Mount Vernon campus, just a few miles from the hustle and bustle of downtown, offers a residential liberal arts campus experience while still providing all the opportunities of DC. Our Women’s Leadership Program and GW athletic fields are located on this campus. What distinguishes a GW education is the way we consistently put knowledge into action through research, internship, and service opportunities for students in all academic areas. 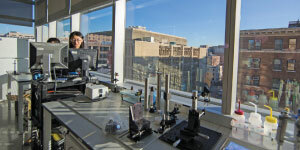 Our students have access to innovative facilities and faculty to support their research in all subjects. Students and faculty have worked together on topics such as food waste in DC public schools, cholesterol transport in HIV and Tangier disease, and how personality affects purchasing. As the top-ranked school for internships, we excel at helping students land internships in the nation’s capital and beyond. GW students gain invaluable professional experience and often even security clearance during internships at the White House, the US Department of State, Folger Shakespeare Library, and NPR, just to name a few. In addition, we encourage students to give back on the local, national, and international levels through University-wide community service, including Freshman Day of Service and Alternative Spring Breaks. 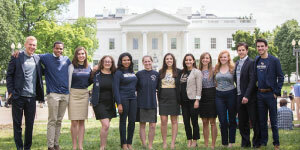 GW strives to recruit a diverse and inclusive class each and every year. We do this through our holistic review process, which takes into account not just overall grades but also course rigor, essays, recommendation letters, and extracurricular activities. This allows us to admit students who have the academic preparation, personal qualities, and motivation to thrive in GW’s dynamic environment. GW is test optional, allowing students to choose whether or not to submit SAT/ACT scores, because we believe a student’s performance throughout high school is the best indication of college readiness. Earning a GW degree is invaluable, but it takes an investment—of time, effort, and money. We believe that investment is within reach for every admitted student, and we leverage our resources to make it worthwhile. GW guarantees students fixed tuition for up to five years of study, meaning the tuition you pay your first semester will be the tuition you pay your final semester. No surprises here. GW also invests more than $185 million in financial aid, which is awarded to 70% of the incoming freshman class. We believe your investment in GW will pay dividends for the rest of your life. Are you ready?